It was the post Mardi Gras sight of a head-piece tumbling off a drag queen and rolling down the empty street like tumbleweed in a Sergio Leone movie that got writer/director Stephan Elliott’s mind whirling. As he tells us in the audio commentary of the 10th Anniversary Collector’s Edition of The Adventures of Priscilla Queen of the Desert, that single image was the basis for what was to become one of this country’s most irreverent and fabulously feel-good films – that and Elliot’s friendship with Cindy Pastel, a much-loved local drag queen who provided the role model for Hugo Weaving’s character Mitzi. Like Mitzi, Cindy has a wife and young son and we meet them all in a terrific featurette on the DVD called Ladies Please, made to coincide with the film’s release in 1994 and help explain Sydney’s decidedly queer drag scene to an offshore audience. In it we join Cindy/Ritchie and her son Adam after the screening of Priscilla at the Cannes Film Festival for a tete a tete with Weaving and his co-star Terence Stamp who plays the adorable transsexual Bernadette. Stamp asks the 12 year old if he’s proud of his father. ‘Of course!’ he answers without a moment’s hesitation. Weaving asks if he’ll follow in his dad’s footsteps to which he replies that he can’t quite see himself in a frock. It’s a cute encounter and calls to mind the scene in which Mitzi butches it up in moleskins and Akubra to impress his long lost son but only manages to misfire with his spittle instead. While Weaving and Stamp give Priscilla its emotional heart, it’s Guy Pearce who lashes on the ‘eye candy’ as the bitchy Felicia. Elliott tells us he cunningly convinced Pearce to take off his shirt as often as possible during the shoot and fans are eternally grateful to him for it. The ABBA fan club, however, was not so stoked, especially at the contents of the little vial that Felicia carries around with her – the sight of a drag queen revering an old piece of Agnathia’s turd had them boycotting the film en masse. Some feminists also had conniptions at various politically incorrect moments in the film like the mail order bride (Julia Cortez) and her Phat Phong Road ping-pong act. 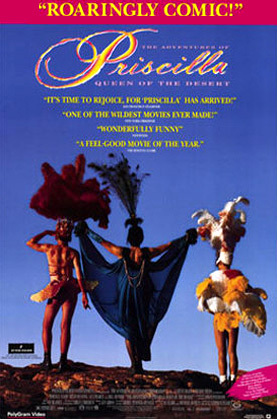 But at its core Priscilla is a film about tolerance, fun and dressing up – and geeze, do these guys dress up! Lizzy Gardiner won an Oscar for her crazy cozzies, amongst which is a 60 metre long, silver lame outfit worn by Pearce atop a giant stiletto on the bus named Priscilla – a seminal Australian film moment. So stuff this one in your Christmas stocking, get out the glitter and head off (in Dragarama no less) on the most outrageous outback adventure ever concocted.